This unique property is located in the exclusive residential area of Chayofa in the municipality of Arona. You can reach the sandy beaches of Los Cristianos, Playa de Las Americas and Costa Adeje as well as the world famous water park "SIAM PARK" in a few minutes by car. The villa is set in a huge palm tree garden with a large ever green lawn. The property has a heated swimming pool with a counter current system for fitness training, underwater massage and endless no-lap swimming, a barbecue area with a shady dining area, a chill out area with sea view and also mountain panorama. There are plenty of comfortable sun loungers available. The Viva Royal consists of three units, the main villa, an apartment and a studio, offering accommodation for up to 20 persons. The basic price is based on an occupancy of up to 12 persons in 6 bedrooms (Main Villa). Depending on the size of the group, the apartment and/or the studio can be rented in addition but it will not be rented out separately to not disturb your privacy in the main villa. Main Villa: the main villa consists of 6 bedrooms (2 bedrooms with 2 single beds each and 4 bedrooms with double-beds) offering accommodation for 12 persons. Four bedrooms have en-suit bathrooms while the remaining two bedrooms share a bathroom. The fully equipped kitchen with a large kitchen table can seat 6 persons comfortably. There is a spacious open plan living room with a large dining table for up to 8 people. Table extensions are available. Apartment: The apartment is connected to the main villa and has direct access to the pool and garden. With its 3 bedrooms (2 bedrooms with double-beds and 1 bedroom with a single bed plus a pull-out bed) it offers accommodation for 6 persons. One double-bedroom has an en-suite bathroom while the other two bedrooms share a bathroom. The living area is spread out over two floors. There is a spacious living/dining room with TV and a fully equipped kitchen with a breakfast-bar on the ground-level. On the first floor there is another living-room with TV from which you have direct access to a large terrace with a stunning view of the ocean. There is a charcoal grill for your exclusive use and a garden table for 6 persons. Studio: The studio has also direct access to the pool and garden. It has a large double-bed (160 cm), a kitchenette and a full bathroom. The house is not suitable for extravagant parties. To explore the island and for bigger grocery shopping trips, we recommend hiring a car. The owner, Johannes, is originally from Austria. He has lived in Tenerife since 2002 with his Spanish wife and his two sons and is happy to share his vast knowledge of the Island with you, providing you with excursion tips and recommendations. The villa is the perfect place to escape from it all. You are away from the bustling resorts but close enough to use them if you wanted. The property complies with all the requested security measures and is an officially recognized holiday home by the the Island Council of Tenerife. The house with its various terraces and patios and the large garden make it an ideal place for large groups, giving you the opportunity to stay all together under the same roof but at the same time offering you privacy if desired. In the main villa the living room offers seating for 8 - 10 people. The apartment offers with its two additional living rooms seating for 6 persons. Main Villa: Dining table for 8 pers. kitchen table for 6 pers., BBQ area table for 14 pers., Terrace table for 6 pers. Apartment:Dining table for 6 pers., breakfast-bar for 4 pers.,Terrace for 6 pers. We are so pleased that you all enjoyed your special family holiday at our villa. It has been a pleasure meeting you and your family and we hope to see you again soon! We had a fantastic week at the villa. Plenty of space for our party of 8 children and 6 adults. Barabara was really welcoming; would definitely return. Thank you! We are really pleased that you enjoyed your stay and hope to see you again soon! Thank you for your visit. Our family had a relaxing and very enjoyable stay at ther villa. The areas were spacious and the help from Barbara fantanstic. The outside chef, Roberto, was also excellent. We are really pleased that you all enjoyed your stay and hope to welcome you back at some point in the future. Thank you for your visit! We were a group of 4 couples and 5 children under 8. The villa is equipped with everything we wanted and we rented the Main House and the Studio. The manager, Barbara, was extremely helpful and sorted any minor issues out immediately. We would go back if we return to Tenerife again. 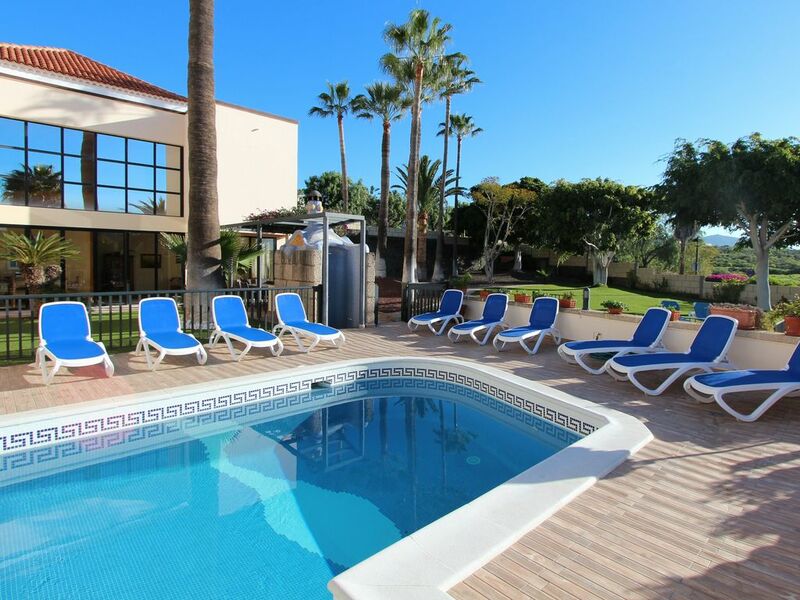 The neighbourhood is very tranquil but only 10 minutes from Los Cristianos. Car rental is recommended as the village is quiet during the day. There is parking for at least 3 cars on site. There is a small supermarket within walking distance but a better one (Dialprix) about a mile away in La Camella (road is very busy and narrow so not walkable). Bedrooms are fine and plenty of bathrooms too. Lounge is big with TV (Netflix and limited satellite) but only has soft seating for about 7 people. Similarly dining area inside and outside only seat 8/9 at a time. Fine for us as children ate separately but not convenient for larger groups of adults. Gardens are large with slide, goal nets and playhouse - happy children!! Pool is really a large exercise pool with current machine to swim against if you want. Two smallest children (2 and 18 months) couldn't splash around in it as it is too deep, even with adult supervision. However, they loved being towed around in the current and the playhouse was well used too. Older children enjoyed the pool though as they were good swimmers. Kitchen is well equipped but the work top area is small compared to the overall house size which made most meals a two shift affair (children then adults). The standard size fridge/freezer was always completely full up and we were glad there was another small fridge in the Studio as a back up. Nice BBQ and seating areas outside and outside shower for pool was helpful. The internet connection was not reliable - OK for browsing etc. but not helpful if you need to contact your work/business for any issues (still you are on holiday!!). General summary is a large villa in a very convenient and quiet area, mostly well equipped and especially suitable for groups with small children. Hosts were excellent and we would happily return. Thank you very much for your valuable review. We are pleased that you enjoyed your family holiday. We will follow up the points you have raised and make improvements. Concerning the soft seating in the living room and the indoor dining table, in both areas improvements have been planned and will be implemented shortly. Unfortunately we were not aware that you experienced problems with the internet connection during your stay, we will now check this and have it fixed. It has been a pleasure hosting you and we hope you will visit us again. We are really happy that you enjoyed your family holiday and hope to see you again soon! Thank you very much for your visit. We were greeted by Barbara on arrival who was amazing throughout our holiday. The photos on the website do not do the villa justice it is much larger than you would expect and has everything included along with a wonderful garden and swimming pool. We are a family of 13 which included an 18 month old baby and everything was provided for us all. Barbara was on hand at any time we needed her and was extremely helpful even arranging taxis on our departure. The villa is situated in a village type setting with has a convenience store, pub and restaurants within walking distance. Los Christianos and Las Americas are a 10 minute taxi ride away which costs anything between 8 and 10 euros. We used the Siam Mall for food shopping which again only a short drive or taxi away which sell everything you need. I cannot recommend the villa enough and would like to thank Barbara for making our time there perfect and hope to see you again very soon. Thank you so much for your positive feedback, Tracey! It has been a real pleasure meeting you and your family and we hope to see you again soon. The Villa is situated in the quiet and elegant residential area Chayofa Alto 300 meters above sea level. But nevertheless only a 5 minutes' drive away from the sandy beaches of Los Cristianos and Playa de las Americas and only 15 minutes by car from the airport (TFS). Various restaurants easily reached within 3 - 5 minutes on foot. Golf: There are a few golf courses close by: Golf del Sur, 12 km, Amarilla Golf & Country Club, 8 km, Golf Los Palos, 6 km, Golf Las Americas, 3 km, Golf Costa Adeje, 10 km, Abama, Guía de Isora, 20 km. The initial Set-up is included as well as an additional weekly cleaning service for stays of 14 nights or more. The minimum price is for an occupancy of 12 persons in 6 bedrooms. No charge for children under the age of 2 years. Cots and highchairs are available on demand free of charge. Set-up ist inkludiert sowie kostenlose wöchentliche Reinigung für Aufenthalte von 14 Nächten oder mehr. Der Grundpreis ist für bis zu 12 Personen in 6 Schlafzimmern. Kinder unter 2 Jahre sind gratis. Kinderbetten und Hochstühle werden auf Anfrage kostenlos zur Verfügung gestellt.